One of China's seven ancient capitals, Hangzhou was the political center of the Wuyue Kingdom (907-978) and the Southern Song Dynasty (1127-1279). Retreating from invading troops of the Jin State, the Song Dynasty's imperial court under the rule of the timid Emperor Gaozong (1107-1187) fled and moved its capital south from Kaifeng - then known as Bianliang - to Hangzhou - then called Lin'an - ushering in the Southern Song Dynasty, which left its distinctive imprint on Hangzhou. Its historical heritage from the Southern Song Dynasty includes the Imperial Kiln Museum, the Octagonal Diagram Field, the historical remains of the dynastic palace, Qinghefang Historic Street and the theme park Song Dynasty Town. 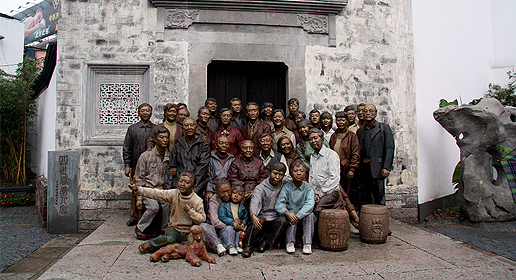 Located at 42 Shijiashan Hill, Nanfu Road, the Imperial Kiln Museum is free of charge for visitors. Driven by the surging demand for pottery and porcelain in the newly established capital, Hangzhou's hills became a porcelain production center. The kilns boasted a range of cutting-edge production facilities and techniques. The majority of the production was devoted to meeting the needs of emperors and imperial courts. Tucked away at the western foot of Wugui (Turtle) Hill, the Imperial Kiln Museum is built on the ruins of one of the original kiln sites, with two display rooms encompassing excavations and other remnants of history. As a showcase for the ancient production sites, the museum houses a collection of porcelain that stands as testament to the history of porcelain and of the Southern Song Dynasty in Hangzhou. Visitors to the museum can also make their own ceramic creations by painting tiles in the on-site workshop for a small fee. The workshop is open every day of the week, although the kilns are only fired up twice a month. Explanations in English accompany a vast array of well-preserved imperial relics alongside everyday items that have been unearthed and painstakingly pieced back together. As one of the magnificent West Lake scenic spots, Octagonal Diagram Field Relic Park is an area of farmland in the south of Hangzhou that provides a pastoral retreat away from busy urban life. The Octagonal Diagram Field has a piece of circular land at its center, with the rest evenly divided into eight areas of land planted with a variety of crops. It has alternating colors and shapes according to the time of year, resembling a traditional Taoist eight-sided diagram used to explain the universe and foretell the future. After the Southern Song Dynasty chose Hangzhou as its capital, traditional rites and fetes were gradually restored. Emperor Song Gaozong gave orders to replicate the ancient governing system of the original northern capital. His command was to allocate fertile land for the imperial family in a similar style to that in Kaifeng. The area chosen was 2,000 meters to the south of Jiahui Gate in Hangzhou. An inscription at the entrance of the park says "To govern a country is to develop agriculture". The Ancient Farming Exhibition Hall displays agricultural tools used during the Southern Song Dynasty along with detailed descriptions. Tianlong Temple and Baiyun Nunnery are on the walking path northwest of the field. The historical remains of the Southern Song Dynasty imperial palace lie at the foot of Phoenix Mountain in Shangcheng district of Hangzhou. The former palace started from Fengshan Gate in the east, stretched to Phoenix Mountain in the west, Tiaozhou Bay in the south and Wansong Mountain in the north. Construction of the palace took more than 100 years. Its architecture was well known for its elaborate building techniques and precise styles. The stunning architectural wonders ended in 1276, the first year of the reign of Emperor Jingyan, when troops of the Yuan Dynasty (1271-1368) attacked Hangzhou and burnt most of the palace buildings. Only a few hundred meters away from the West Lake, historic street Qinghefang covers about 13.66 hectares. The block is the last piece of ancient-style area in downtown Hangzhou. At the southern end of the city center, locals and tourists flock to the historic street, one of the best places in Hangzhou to shop or browse for the city's traditional products and snacks. Old-fashioned shops filled with intriguing wares fashioned according to ancient techniques line the streets. Inside the buildings, which have architectural styles from the Ming (1368-1644) and Qing (1644-1911) dynasties, many shops that have been open for business for more than 100 years. They are famous throughout Hangzhou - and in some cases throughout China - for their tea, traditional Chinese medicine, scissors, chopsticks, tobacco, ham and clothing. At night, the fun continues as red lanterns adorn the street's tiled eaves and Chenghuang Pavilion is lit up like a beacon to the south. To the north, Gaoyin Lane offers a host of restaurants serving up traditional cuisine and warm Shaoxing wine. The 20-hectare Ancient Town neighbors Wuyun Hill in the north and adjoins the Qiantang River in the south. It is the largest Song culture themed park in Hangzhou that showcases two Song dynasties. This scenic expanse reproduces the city as depicted in the well-known painting ‘Along the River During the Qingming Festival’ by master painter Zhang Zeduan in the Song Dynasty, creating a city of taste, melody, rhythm and history. The park has the slogan "A one-day trip in Song Dynasty Town gives you the experience of one thousand years ago". It has applied advanced technologies to the background in traditional culture. It is also known for its night tours. Lin Zhengqiu, history professor with Hangzhou Normal University and chairman of Hangzhou Ancient Town Culture Research Association, said in order to celebrate the 870th anniversary of Hangzhou as the Southern Song Dynasty capital, a culture week will be held during this year's 10th West Lake International Expo Hangzhou. The cultural week will include acrobatics, dances and plays in the local dialect. Other events include a relic exhibition of treasures of more than 800 years old. There will also be an international academic seminar on the culture of Southern Song Dynasty, with prestigious experts from home and abroad to attend.